Knight Shuttles can be designed to fit a multitude of applications to reduce time lost to personnel injuries and help increase productivity. They are inspected and tested before they leave our facility. Table, Shuttles and Carts are available with a variety of accessories, safety features and equipment. Optional Safety Equipment including but not limited to; perimeter fence guarding, bellows skirting, safety mats, audible signals, light signals, toe guards, special control guarding, etc. are not included unless otherwise stated in the product descriptions. Please check with your state, local or plant safety for requirements. We are happy to quote any and all safety equipment needed to meet your requirements. 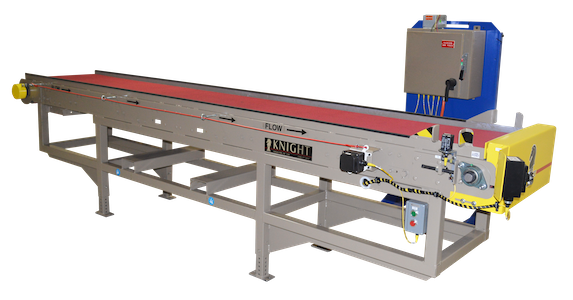 Note: Listed Knight Global shuttle/conveyor configurations are standard. Custom configurations are available upon request. Eliminates the need to stop for dunnage reload by accumulating multiple dunnages at once. Fully Adjustable gravity feed with manual actuations to completely automated systems. Holds multiple containers in queue to reduce fork truck traffic. Max. Capacity: Up to 6,000 lbs. [2,721kg]. Optional Lift, Tilt, and Rotate functions for the operator work stations. Fork lift or Fork-Free Applications. 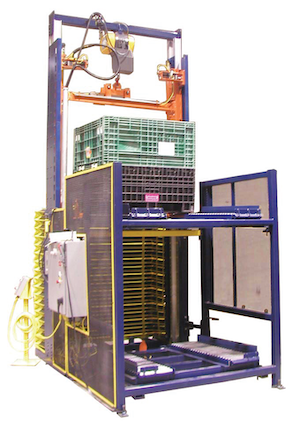 Optional Tugger Cart for Fork-Free Applications. Air, Air/ Electric, or fully Electric Systems Available. Provides a shuttle system in a compact footprint design. Anti-Fall Shot Pins are actuated instantly if any slack is detected in the elevator chain. Polished chrome shafts are used at all slide and pivot points to minimize the wear and prolong component life. Max. Capacity: Up to 2,000 lbs. [907kg]. 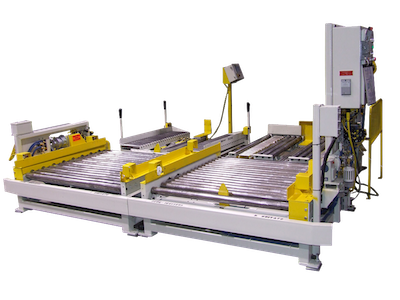 Can be built around a specific container size or with expandable roller beds for future operations.. Provides a wide range of flexible conveying solutions for assembly lines, industrial, and packaging. Commonly used for assembly line operations, sorting, packing, inspection lines, etc. Improves your line’s efficiency and productivity, leading to a stronger return on investment for your plant. Light or Heavy Duty System. Accurate Small Part Handling and Positioning. Gravity or Electric Powered Systems.